Before becoming a dad, I didn’t think about hair. For me, it was pretty much ‘wash and go’ my whole life. I never needed to brush or comb my hair. It was always short and if it grew out any appreciable amount, it had a mind of its own unless I put a RIDICULOUS amount of product in it. My hair care plan was “go to the barbershop once a month and keep it short.” Done! Now that I have three daughters , I need to keep their hair neat and ‘manageable.’ I am amazed at how much time and energy a young girl’s hair can take up. When we had just one daughter, I kept her hair relatively short (shoulder-length bob with bangs a la Dora the Explorer) and, lucky for me, she liked to wear hats. ☺ That was EASY. I even cut her hair myself for a few years. I was proud of my work, but after a while I realized that all the “Cute hair! Where did you get her hair cut?” comments from other parents were most likely hints that someone (me) messed up and they want to make sure to avoid that hair stylist for their child! When she was about three, I finally gave in and brought my first daughter to a children’s hair salon that I gathered from eavesdropping on the moms at the park was a good place to go. It took a couple tries, but I finally found a stylist who understood what I was after and wasn’t condescending to me. Now, several years and two daughters later, we go regularly to get all the girls’ haircuts at what has come to be known as “The Haircut Store”, aka Doolittle’s. She responded, “Ok” and left the room. Just then, my three-year-old came sauntering into the kitchen like Queen Elsa, wearing a HUGE grin. Nothing seemed amiss, so I was initially confused. 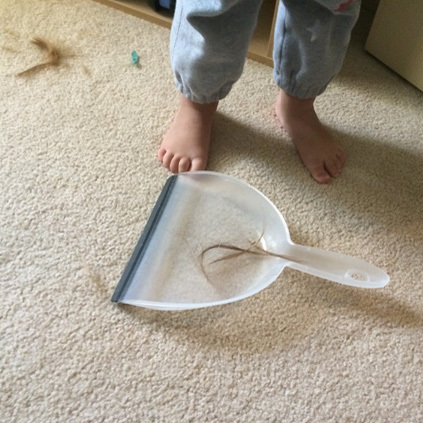 Then my son came peeling around the corner to inform me, “She had scissors in the living room!” A HUGE rules violation in my house. It’s an improper benefit. I needed to investigate. 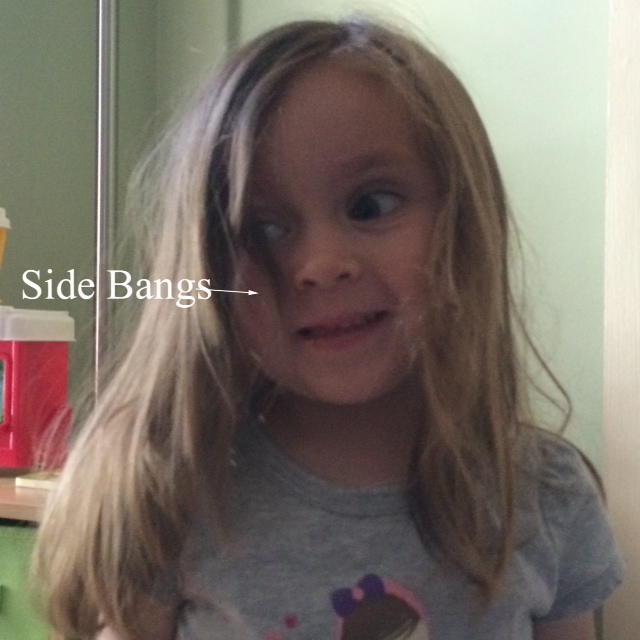 “I wanted bangs,” she responded. Turns out, she did a decent job of giving herself side bangs and besides “It’s Just Hair Isn’t It?” . Maybe next time, she will figure out how to give herself Curlz.